Back in August of last year, we congratulated Laura for being the 50,000th member. Then in October, we hit 60,000 members. Now... we here at #TeamHarri are proud to announce that we reached OVER 100,000 MEMBERS back in March 2015! We finally sat down with Rachel, our 100,000th member after busy schedules delayed us from speaking to her sooner to discuss her experience with Harri. When did you join Harri? I joined Harri about 5 months ago. I was looking for a way to better project myself while applying for jobs and Harri was the top result on Google. As soon as I finished creating my profile I received about 3 requests to apply for a job within the hour. What has your experience been in the Hospitality Industry? I’ve been a Barista for about 3 years now. I’ve worked for Locanda Verde, Intelligencia, Lafayette, and Donna. I’m really focused on making a successful career out of it. Have you found a job through Harri? Yes, I found my jobs at both Lafayette and Donna through Harri. They’re both great companies that I really enjoy working for and I’m very excited to be part of each of their teams. I definitely plan on staying in the hospitality industry and it’s my goal to start my own business. My next step is to go to Honduras and work on the farms where they grow coffee. I want to change the way that farmers are being both paid and treated. It’s a very laborious process. Improving work conditions will help the coffee industry in many ways, especially with providing a higher quality product. How can Harri help achieve your goals? Harri is a great site for networking and gives you the ability to go beyond just applying for jobs. As Harri grows as a company and as I grow as a professional, I will continue to use the site to take the next steps in my career and even hope to hire staff through Harri when I’m running my own business. I love that I’m able to showcase how I am as a professional and who I am as a person. Back in August, we here at #TeamHarri celebrated a milestone: 50,000 members! It's now October and we are proud to announce that Harri is now over 60,000 strong. To commemorate this accomplishment, we sent the record breaking member Dounia A. and a guest to to dinner on us. We recently sat down with Dounia to discuss her experience with Harri and what it was like to dine at Bar Primi. Read the interview below. How did find you discover Harri? I was online looking for part time jobs in the hospitality industry. I have experience as a hostess when I lived in Germany. I wanted to see if there were any opportunities like that here in NYC. Eventually I stumbled upon Harri. What made you decide join? All of the listings were very appealing and the website was very professional as opposed to Craigslist. I really liked the media element that Harri has. I also liked the questions employers asked prior to applying. It helps you understand what they are looking for. I really love that you can showcase yourself and personality with the online portfolio. A regular resume just doesn't cover that. Harri allows you to display a more in depth view of who you are than resume. The hiring process is a lot easier for both sides too. I like that you can view and learn about a company before you apply and that employers state exactly what they are looking for so you can be best prepared. How did you feel when you found out you were Harri's 60,000th member? I was very surprised because I recently joined. I wasn't aware that there were this many people already apart of the community. Have you gotten any jobs through Harri? I just joined so I haven't gotten a job yet. I've gone on 2 interviews, but I haven't heard back from them. We are still communicating on Harri. I have a few other employers interested in hiring me so we shall see. How has your experience with Harri been so far? So far everything has been perfect. The job alert emails constantly remind me of all the opportunities available. I like to see what is going on in the industry, the different types of jobs available etc. The entire experience is a lot easier than using other sites. Have you used any other job sites to find hospitality work? Yes, but nothing comparable to Harri. Tried Craigslist but I didn't find it too appealing. It was not a great experience. Since you were our 60,000th member, Harri sent you and a guest to Bar Primi for dinner. How was it? It was wonderful, thank you so much. It was actually my birthday so it worked out perfectly. Bar Primi is currently hiring front of house positions. If you are interested in joining the team, click here to view their openings. For the second installment of our Tips & Tricks series, Harri member Christine Black shares advice for employers sourcing talent in the hospitality industry. Christine originally came to Harri as a job seeker and now she’s a hiring manager at Gigino Trattoria, an Italian staple located in Tribeca, NYC. In the previous installment of this series, Christine shared tips and tricks for job seekers on Harri seeking employment opportunities in the hospitality industry. This time around, our interview with Christine centers around employers in the hospitality industry finding talent on Harri. What was the deciding factor to use Harri to hire employees at Gigino Trattoria? We were originally using Craigslist and we weren't getting the quality candidates we were looking for. People were not showing up for open calls, not returning messages and they were no shows for on the job training. It was frustrating to say the least. I told the owners about Harri and how it is a solution which is less expensive than Craigslist and much easier to screen and hire with. They gave me the green light to use it. How was your hiring experience with Harri? "Hiring for our restaurant normally took a few weeks. With Harri, it only took a few days. It's a lot easier to keep track of candidates through Harri than with email. It was also easier to communicate who was coming in to interview to my colleagues by forwarding Harri portfolios." We posted our openings and had a great response. Most candidates we found through Harri were excellent and all of them showed up to interview. A lot of the people we hired through Harri have undergone training and still work with us. How does Harri compare to other hiring platforms for the hospitality industry? Harri is the only platform that gives advantages to both job seekers and employers and it's very easy to use. In the hospitality industry, there is a trial period for new employees. You have to see if their skills and personality are a good fit with your establishment. The information gained through Harri at the start of the process is extremely important and cuts down on hiring time. Would you recommend Harri to other HR professionals? "I think that they'll be pleased with the combination of ease of use and organization Harri brings. The cross promotions are great, and it's so easy to interact with candidates. Harri portfolios give both the employer and the job seeker an opportunity to present themselves." Harri isn't expensive nor time consuming. It's definitely a step up from the rest of the hiring sites. I would tell other HR professionals that they have nothing to lose by giving Harri a try. There is no harm posting a job to see how it works for you. If you'd like to work with Christine and the team at Gigino Trattoria, they are currently hiring a Host / Hostess. Interested? Apply here. For the first installment of the Harri Tips & Tricks series, #TeamHarri sat down with Christine Black, a member of Harri with a unique perspective. Christine originally came to Harri as a job seeker and now she's the one doing the hiring. She has decided to share tips and tricks for both job seekers and employers with us. Check out part one of our interview with Christine below where she gives advice to job seekers in the hospitality industry. How did you find Harri? I was searching for management opportunities online and I came across a post which led me to Harri. I found a few jobs I wanted to apply for. To be honest, I was hesitant at first. I didn't finish profile. I decided to keep searching on Craigslist but I had no luck so I ended up coming back to Harri. I needed a job and I wasn't finding anything on Craigslist. I gave Harri a second chance. "I think it's a testament to the platform...I was hired very quickly because I was able to showcase myself better on Harri than I would with an ordinary resume." What was your experience as a job seeker like? It was very good. I wasn't job hunting on the site very long, I ended up landing a job quickly. I was interested in a job but I wasn't able to attend the open call. 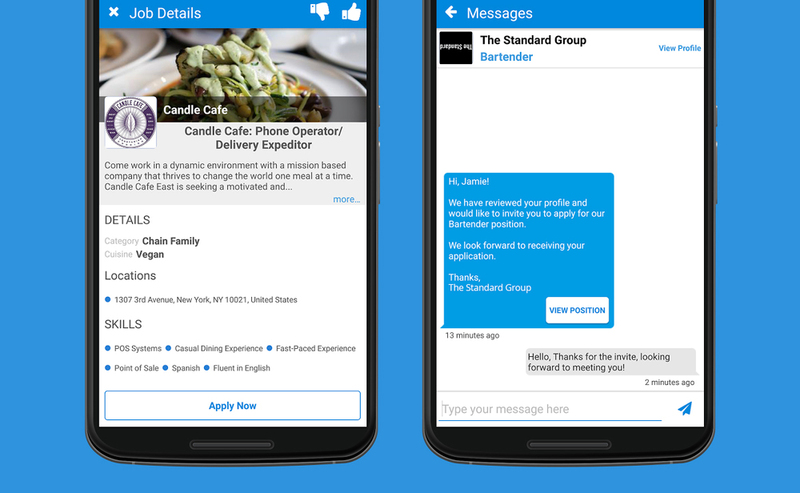 I used Harri's messaging platform to speak with the prospective employer. We scheduled an interview and then I landed a job at Gigino Trattoria. I think it's a testament to the platform. Even though I wasn't able to attend the open call, I was hired very quickly because I was able to showcase myself better on Harri than I would with an ordinary resume. What jobs did you get through Harri? I joined Harri as a bartender but after the discussion with the hiring manager I decided to apply for management positions. I got the job working at Gigino Trattoria. "Job seekers can showcase more of themselves on Harri than on a resume or cover letter. For employers, they can understand the job seeker better and see if and where they fit into their organization." Have you told other job seekers about Harri? Yes I have. I told them that Harri allows prospective employers a better sense of who you are. It actually helps both parties. Job seekers can showcase more of themselves on Harri than on a resume or cover letter. For employers, they can understand the job seeker better and see if and where they fit into their organization. What advice would you give to job seekers? I would say the more information they provide on their Harri portfolio, they increase their chances of getting hired. It's true what they say, the "early bird gets the worm". After you apply respond early and often to your prospective employer. Always present yourself as best as you can. Don't be as casual with employers as you would be with say, your friends or coworkers.